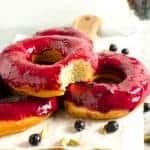 Perfectly deep-fried, fluffy, crisp, golden doughnuts with a warm, aromatic cardamom infused blueberry glaze with just the right amount of sweetness – these Cardamom and Blueberry glazed Doughnuts with that strikingly beautiful speckled purple glaze are a tasty twist on a classic! It all started with two big punnets of bright, fresh, firm blueberries for the price of one at our local Farmers market a few weeks ago. Knowing how versatile these little guys are I was super excited to bring them home and put them to good use. Blueberries in general have a subtle flavor with a nice balance between sweet and tart and they pair really well with a host of other more prominent flavors. 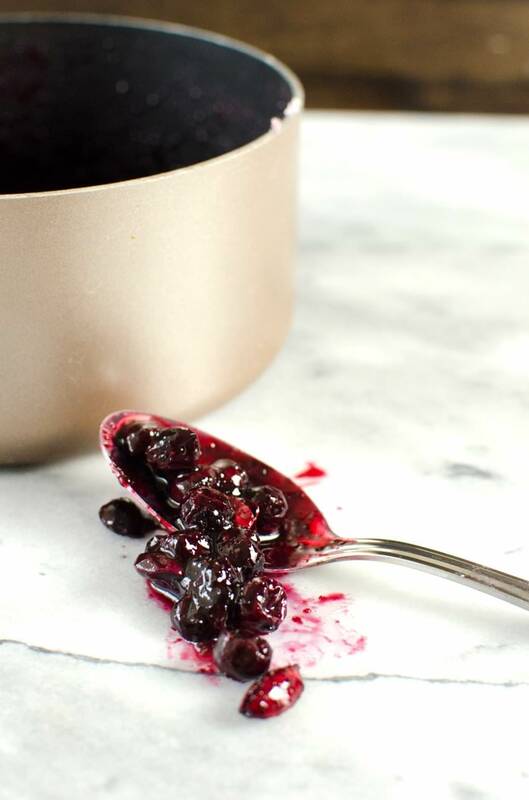 The blueberries are cooked with cardamom spice to create a thick luscious syrup with warm, aromatic, floral notes. The berries are then crushed into the syrup and mixed with confectioner’s sugar to create a sweet glaze. 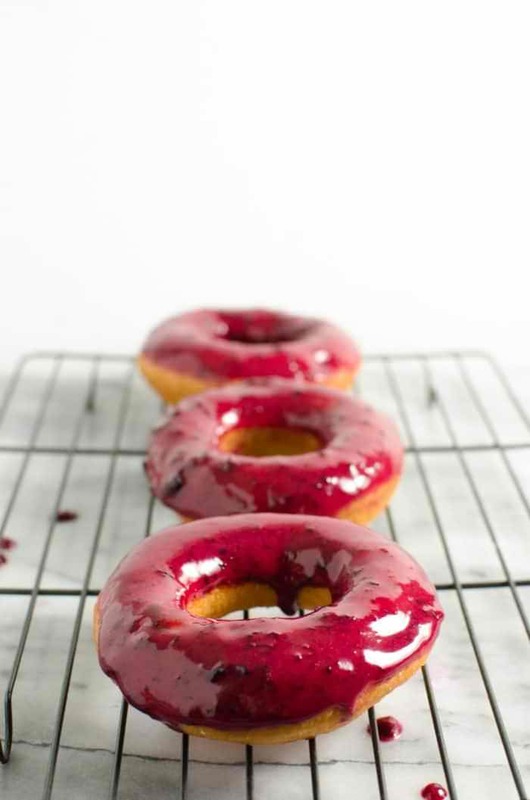 The cardamom yields an extra bite to the sweet glaze, a uniquely warm, spicy, aromatic flavor profile that instantly elevates the blueberry glaze. 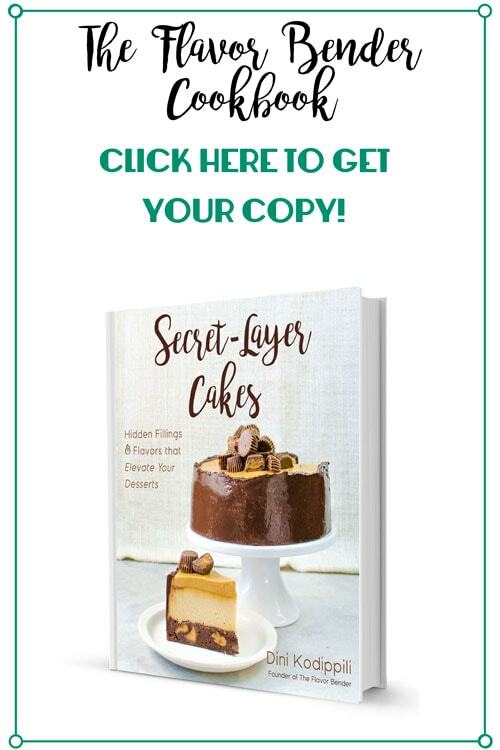 You can choose to create a smooth glaze by passing the blueberry syrup through a sieve to collect the pulp, or make a glaze with speckled bits by crushing the blueberry into the syrup. Personally, I love the speckled glaze and that’s what you see on these blueberry glazed doughnuts. 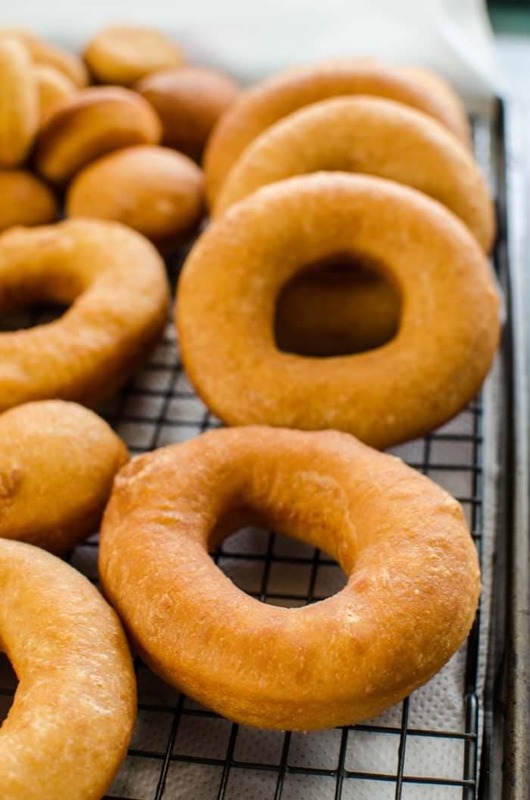 The cardamom tempers the sweetness of the glaze so that it has just the right amount of sweetness, which also goes well with the doughnut dough which isn’t that sweet either. But more than anything, I just love how striking beautiful that purple glaze looks on those golden doughnuts! 🙂 I know you will love it too! Make the doughnuts according to this recipe here. While the doughnuts are being proofed before frying - place the blueberries, cardamom, sugar and water in a saucepan and heat the mix and bring to a simmer. Simmer for 5 minutes, covered (to soften the blueberries). If the blueberry syrup is very thin, uncover the saucepan and simmer for a few minutes to thicken the syrup slightly. Set it aside to infuse and cool down. Discard the cardamom pods if you used them. Using a fork, crush the blueberries into the syrup. Place the powdered sugar in a bowl. 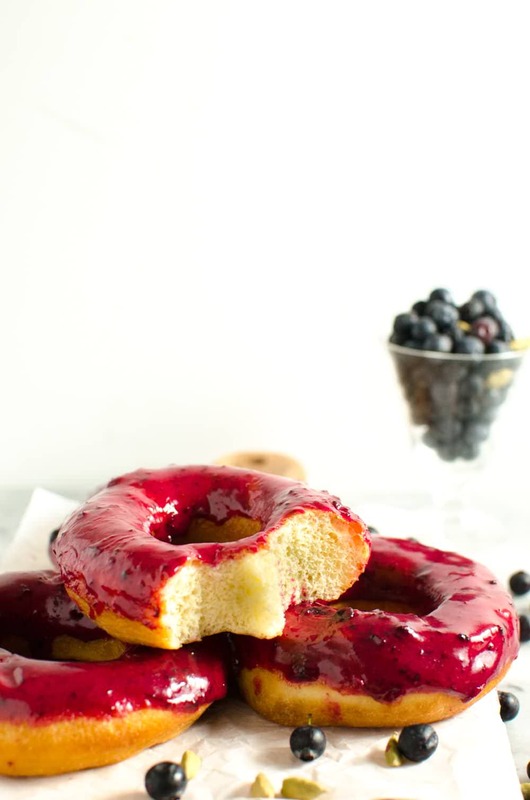 Add about 3 tbsp of the blueberry cardamom syrup and whisk the mix to form a glaze. Add more syrup as needed, to form the consistency that's required. Once the doughnuts are fried, dip each one in the glaze to coat (either one half or both sides). Place on a wire rack to let the excess glaze drip down. 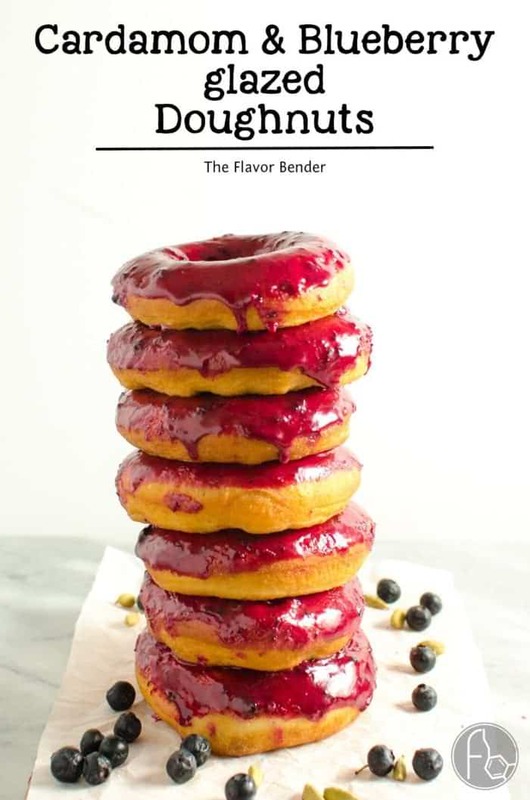 If you liked this cardamom and blueberry glazed doughnuts (blueberry doughnuts) recipe, don’t forget to subscribe for new (and free) recipes by entering your email address on the side bar (and get all these recipes delivered straight to your inbox), so you don’t miss out on a thing. You can find me on FACEBOOK, TWITTER,INSTAGRAM, PINTEREST, YOU TUBE and GOOGLE-PLUS too.